Does the thought of summer sun damage scare you more than the ghosts and goblins of Halloween? Have no fear! 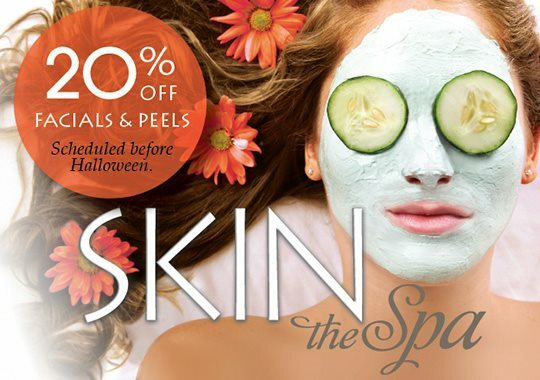 During October, SKIN the Spa at Runnels Center is offering 20% off all facials and peels - just in time to get your skin glowing for the fall season. So leave bad skin to the zombies. Book your appointment today and follow this professional advice on seasonal skin care from SKIN’s experts. Exfoliate! Exfoliation is the key to glowing, radiant skin. At SKIN, we offer a variety of exfoliating treatments and products, such as Dermaware’s Bare Fruit Enzyme Mask. Gentle enzymes from papaya and pineapple dissolve dry, dead skin, revealing a healthy and smooth complexion. Restore! Treat your skin with Vitamin C, one of the most powerful and beneficial anti-oxidants! Neocutis’ ReActive Anti-Oxidant Serum provides an advanced shield against skin-aging free radicals using patent-pending Vitaplex-C.
Hydrate! Hydrate! Hydrate! Our skin is made up of 70% water, so it’s important to keep it hydrated topically with clinically proven ingredients. Obagi’s Hydrate, a time-released moisturizer containing hylauronic acid, is a staff favorite. Protect! Last but not least, protect your skin! Make sure sunscreen is part of your daily skin care routine. Neocutis’ Journee, one of our best-selling products, is a tinted SPF 30 sunscreen that doubles as a daytime moisturizer.